League of Legends | Gaming Time! Yesterday I discovered something, I wish I hadn’t. Kinda. And this is, how it’ll look like. 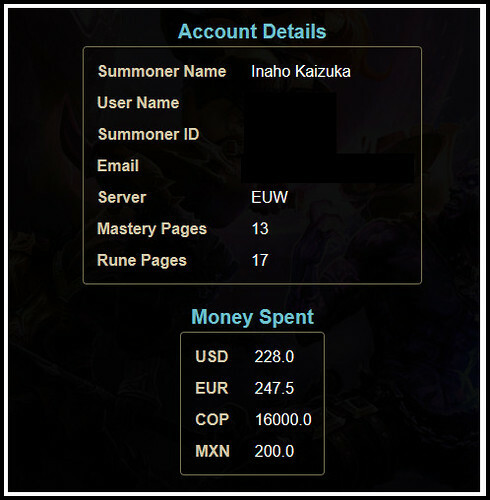 Your account data, amount of Mastery- & Runepages and the money wasted – in every possible currency. And no, there hasn’t been just some calculations. If you like to know the exact amount of money spent, you actually have to add the amount of each currency.. 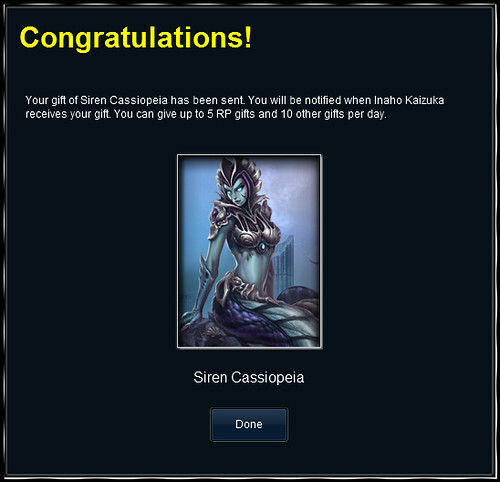 Sometimes I spontaneously feel the need of receiving some surprise gift (the “feel-like-a-little-girl-at-xmas-syndrome”), so I use my friend’s account to send me some mystery skins in LoL. Actually……. those skins aren’t usually worth their price. Usually… you won’t get any skin more worth than 975 RP. Now you can say, still Mystery Skins cost only 490 RP buuuut.. wait for a 975 RP skin to be in sale.. and you will get it for 487 RP -.-! Not even talking about the 750 RP and 520 RP skins. So if you’d just like to save RP.. I’d say DON’T fall for the mystery gifts. Especially when you can’t get ultimate skins (currently Ezreal, Udyr and Sona) – may it be because you got them yet or don’t have the champs. If you’re lucky, you can still get some worth 1300 or more RP (and actually indeed save some money) or a legacy skin, which are only be sold for limited time during the year. Anyways, when I send them to myself, it’s rather for the surprise than trying to save some money. 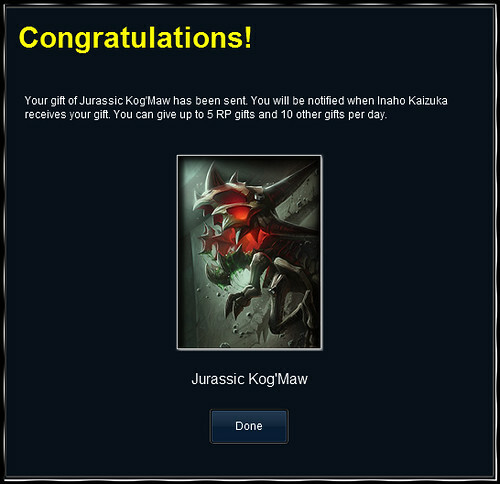 Besides that this skin is pretty nice, I got 2 skins with Kog yet, included an ugly legacy skin ;). Anyway, I will use this one. It’s a 975 RP skin, could be worse, didn’t save anything but between 487 and 490 RP isn’t a huge difference aswell. This one was a fail. At least the skin itself isn’t ugly or anything.. still it’s only worth 520 RP – meaning on sale one can get it for 260 RP. Above all… due to having Mythic and Jade Fang Cassio.. I doubt I will use this skin much. Now this one was pretty unnecessary. Imho this skin is ugly as **** ._. 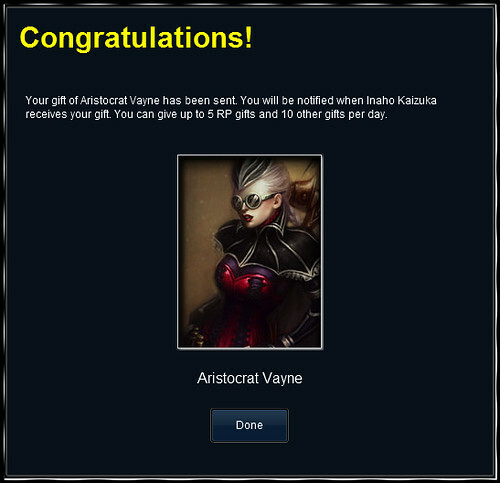 And having Dragonslayer Vayne, I won’t think twice which one to use in game. But well, an addition for the collection, nothing else really. So the PBE has recently been updated with some awesome skins to the April’s Fools Day. 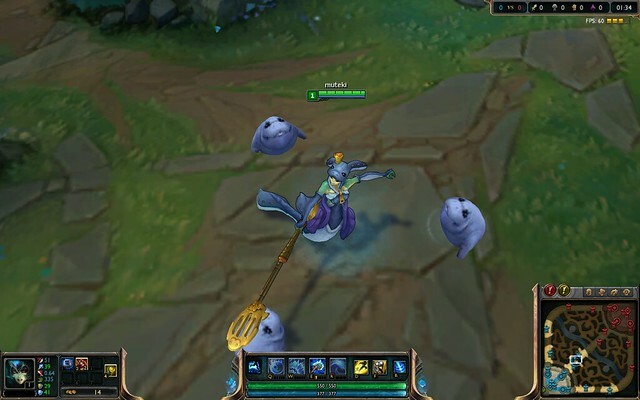 Here the Banana Soraka, and look closely, she IS throwing the bananas! This “joke” was lame, lol. And with this skin even cuter! This moment… when the new 750 RP skin outclasses the ultimate skin. Also Amumu and Nasus are getting new skins, however, I didn’t try them out today. One thing I am really looking forward to is this. Champion Mastery. It’s just brilliant! Can’t wait to get this on EUW! And finally tried out the new support, Bard. These yellow thingies on the map he gotta collect for his passive btw. And yes, he was fun, tho bugged abit while Kalista was linking to him. I wonder if he can be a valid jungler aswell. Let’s see what the future brings! Ranger’s Trailblazer instead of Stalker’s Blade: I felt Malzahar really mana hungry. Considering that in a usual game you won’t always have the blue buff, etc.. I’ve found the pink weapon easier – for now. It’s also like an extra heal, so I think, I will keep this one. I began Q / E instead of Q / W (after seen it somewhere else). However I felt the start even more difficult like this, so I’ll go with Q / W / E next time again. Jungle Malzahar AD – Legit! Gold Division and still unable to jungle properly, so I might try this “New Meta”, as Malzahar is my 1. Mid champ to choose. It’s worth a try, at least I’m used to the champ yet, AP tho. Use your spell 3 times at the fountain, so when you use it for the 4th time, Voidling will spawn. Blue side highly recommended (Gromp start) since Malzahar burns a lot of mana in the jungle. Also got 2 mana potions to slightly improve clearing speed. At first upgrade Machete to Stalker’s Blade (then get Warrior enchantment), get Boots of Lucidity and items like Manamune, Last Whisper, Black Cleaver, etc. Try to get as close to 40% CDR as possible. Warrior + CDR Boots + Masteries + Black Cleaver will give you a total of 40% cdr. You can also go for CDR glyphs and skip Black Cleaver. Also check the video for the complete guide, as this was just a summary. This also makes me kind of “hard-trying” in Normal Draft Pick now. Yesterday I managed to play 1 game .-. As I had to leave for an appointment + Minecraft… (damn you Minecraft XD) But isn’t it the “quality” of a game + its analyzing which does make the difference? Well, at least I hope so! On the first sight pretty decent, with a KDA of 4,5. However, we’ve had a terrible early game in the bot lane. Me and Ezreal played vs Sivir/Lux. Ezreal wasn’t supposed to go Bot, but Mid. But there’s always a smart one who won’t read the chat and will anyway lock on a mage 😀 So okay, we had Orianna in Mid and Ez went Bot with me. I played as usual, in early levels quite agressive which usually makes the enemy use their potion yet. I didn’t keep in mind the fact, that Sivir and Lux could be a quite deadly combo. So my playstyle in this situation probably was abit too careless. My ADC and me didn’t communicate at all. This resulted in him burning his mana, then oom stopping to do anything, while I expected autoattacks from him and throwing my skills on the enemy (incl. ult + exhaust). After “wasting” nearly my complete set of abilities, the only thing left to do (Flash) wasn’t enough to get out of the dangerous situation. We were lucky, as the enemies’ Udyr was dc for a while. Not the whole game, but about early/mid game. After our tower’s fall Ez was able to farm in Bot more or less secure as Sivir and Lux went to help their team and left Bot. Me, I left it aswell, seeing, our Top, Jayce, did quite okay. And the Jayce with 3 kills turned rapidly into a fed Jayce with 6 kills. Me, at the same time, could gather some assists, which increased my own moral by alot. Our Jungler, Shaco, did surely alot for our victory. I think we had like 4 dragons – pretty nice! In the end we could win. Now why did we win? Or – why did the enemy team lose? Because they surrendered. For a reason people say “never surrender”. And there was no baron fight yet, nor was the game even close to end. But especially in Normal Games people tend to be impatient, so they rather throw it. Objectives? It almost seemed like the enemy didn’t even care about the dragon. 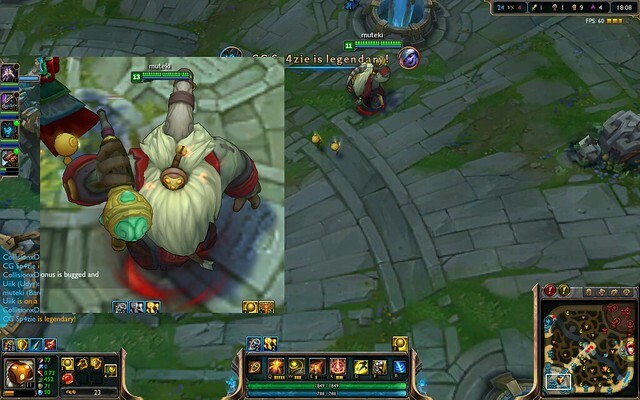 Sure, the dc Udyr is a point. However, their Udyr was Top, they had Vi as Jungler, they had Smite. The DC of Udyr surely made the game difficult for them. Still they had some advantage – even without him. Alot of comprehension and good attitude in our team. No single word has been said about our 0/7 Bot lane. No swearing against our Orianna who failed to read the chat in the champ select. You could say we played calm, together as a team, making the best out of the situation. The team’s moral was high, everyone of us actually had the will and the confidence that this match still could be won. 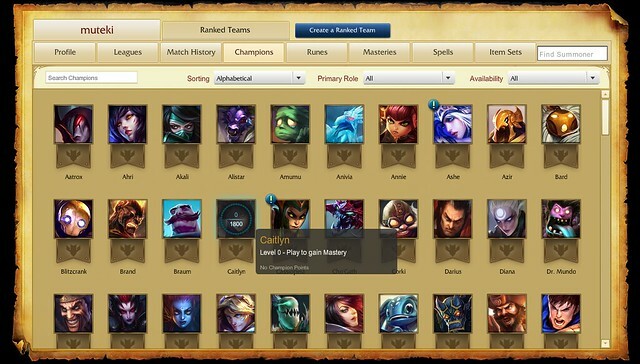 You are currently browsing the archives for the League of Legends category.